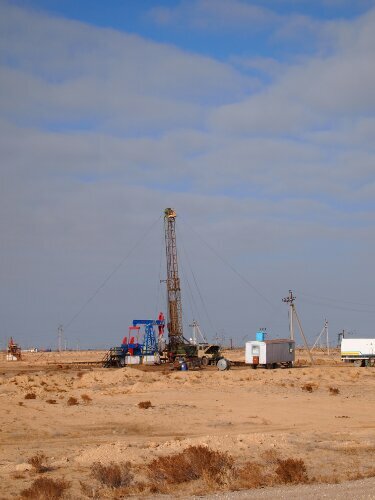 I spent a few relaxing days in Aktau and managed to not get involved with anything too strenuous: lots of internet surfing in cafes and a few drinks with some locals met on couchsurfing. While there I was also lucky enough to meet another cycle tourer: Helen Lloyd. Helen was just reaching the end of her trip and had come all the way from Russia across central Asia and was flying back to London from Aktau. Previously she had cycled solo from the UK to Cape Town, all the way through Africa – a far tougher trip than the one I was attempting and eventful enough for her to have written a book about it: Desert Snow. Helen was planning on spending Christmas in the UK and to then fly back out to Russia in January and spend three months heading north through Siberia. All of which I thought was incredible and made me realise the really amazing things people can do on their bikes. Finally the day I had set to leave came around and it was time for me to head off into the desert. Worryingly the day before I had planned to leave it snowed and there was a lot of slush still on the roads and snow still settled. I didn’t know if this would go or if it would snow again so I decided to leave anyway and hope for the best. Luckily it didn’t start snowing again and out of the city the snow started disappear until it was just the terracotta browns of the desert stretching off into the distance. Unfortunately as I was leaving Aktau I had slipped on some slush as I was pulling away from some lights and twisted my knee slightly. At the time I didn’t think anything of it, there wasn’t much pain and I thought that it would probably be OK if I didn’t push it hard in the first few days out of the city. It transpired that the weather had other plans for me and I had not been riding long when I hit headwinds. Serious headwinds. To start with I didn’t think it could be the wind that was slowing me down so much, so I checked my bike to see if there were any issues with it. I worried that all the extra weight I was carrying for winter touring was having an effect and that three weeks off the bike had weakened me to such an extent I was about half as fast as normal. The fact that it was the wind only really struck me when I lifted my gloved hand off the handlebars and I almost hit myself in the face as the wind lifted it up. I was starting to worry if I would make it to my next destination on time… For I was once again riding on a schedule. 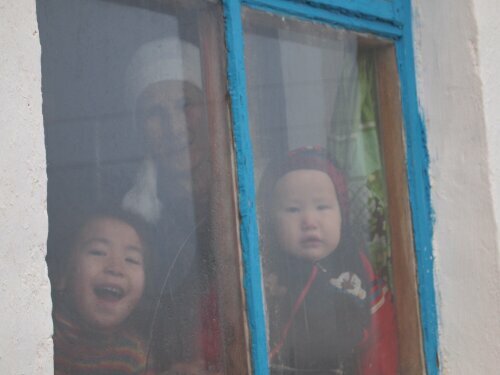 My Uzbekistani visa would be valid from 14 December and it would only last for 29 days from this point. 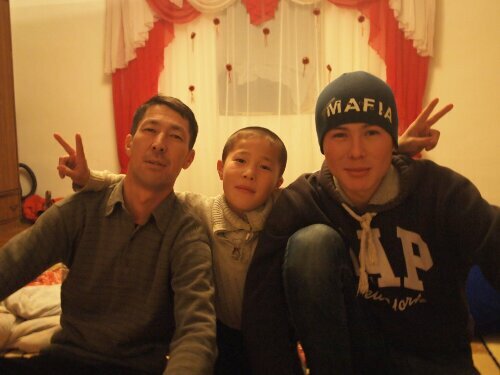 If I arrived in Uzbekistan on the 16th for example, I would have lost two days there. 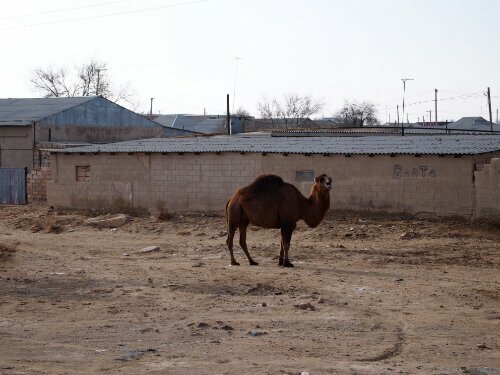 I was keen for this not too happen as I had heard a lot of good things about the sights of Khiva, Bukhara and Samarkand. So I knew I needed to press on. It was while negotiating the so called ‘dangerous section’ that temptation reared its ugly head for the first time. A man pulled up in a large SUV and said where are you going and then told me to put my bike in the back as he was driving there. I thanked him and refused – I’d only been going half a day and still had a lot of time and figured the winds might relent. So I continued to ride into the wind for hours until it was time to camp. At this point when riding with Rubina we would have looked for a likely farmhouse and then asked to camp in their garden. This was not an option as there were no farmhouses likely or otherwise in view. This made choosing a camping spot easy in some ways as one bit of bare mud is pretty much the same as another, so I pulled off the road at 17:00, giving me roughly an hour before dark. As the road was slightly raised I thought it would offer some protection from the wind that was still whistling around…it didn’t. On the plus side I got some good practice camping in strong winds and also putting up my tent in muddy conditions. Lessons learned are that it is probably not worth trying to boil water when you can barely get a lighter to spark even with your hands cupped right round it. I got my stove going and drew the wind shield as tight as possible around it but my instant noodles were still only warm at best! Also it is very hard to sleep when your tent is constantly rocking and flapping. As I started off the wind kept up its blowing and all morning I was fighting forward. 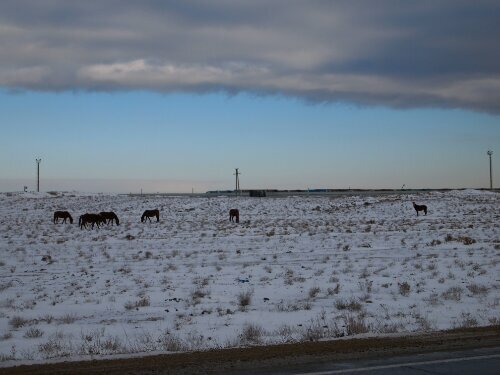 Then I reached the towns of Munayshi and Zhetybay where I had lunch and saw some Kazakh oil fields. Here the road changed direction as well and suddenly I was heading north instead of east and the wind let up and I felt like I was flying. I was so relieved I pushed on and on and was quite close to the next town as darkness was closing in. Having checked the ground for camping I realised it was even muddier than the night before and I was worried about my bike getting bogged down. So I decided to ride the remaining 20kms to Shetpe. The road wasn’t too busy so I thought I would be safe. And I was. Arriving in town I started to look around for a hotel or something resembling one. I asked some locals if they knew one and they looked at each other and spoke and next thing the one with some basic English was suggesting I stay at his older brother’s(uncle I later worked out) place, his uncle being one of the three. Off the back of Turkey, Georgia and Azerbaijan where this sort of spontaneous hospitality was normal I thought nothing of it and agreed. I followed them on my bike, not without difficulty down some dark muddy roads, until we arrived at the edge of town at the house of the uncle: Erbo. Everyone seemed very friendly and they helped me unload my bike and locked it in a shed. They then sat me down on the floor and I ate some dinner with the three guys. Next thing, the one with English is saying how in a hotel I would be paying money and that I should pay some money to his uncle. This shocked me quite a lot. While I knew it was fair it was so different from the countries across the Caspian. In Turkey if I had offered to pay for anything people had looked almost insulted and it had been the same in Georgia and Azerbaijan as well. I was also a little worried as I was not in a good negotiating position – my bike was unloaded and locked up and it was very cold and very dark outside. I didn’t have the energy to try and find anywhere else to sleep. So while I was happy to pay something I was a bit worried they would try and screw me over…which they did. In Aktau I had been paying 1500 tenge (GBP 6) for a room in a hotel; true it was a terrible room but the hotel did have hot showers and an indoor western toilet so I was expecting them to suggest a number close to this. Initially I thought they had…as I mistook the 10,000 tenge they were asking for for 1000! 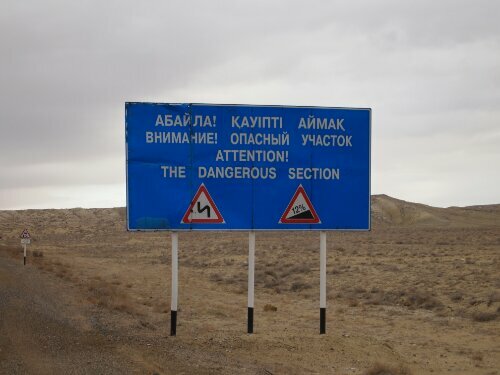 When I realised I almost choked – that was almost double the most money that I had spent on any one night’s accommodation on the whole trip and how much I would expect to spend for a room in a nice hotel in a city in Kazakhstan. Not the amount of money I would expect to pay to sleep on someone’s floor in a small town without a shower or a toilet. Negotiation thus began and clearly realising that they were taking the michael somewhat they halved their demand straight away. After a bit of toing and froing we settled on a number of 2000 tenge. If they had started by asking for this I would not have minded and would have been happy to pay. It was the large number they had started with that made me feel resentful – they’d clearly seen dollar signs when I had appeared and I hadn’t been used to being treated like that on this trip. It was needless to say not the best night’s sleep I have had. The next day I was happy to get away but was feeling quite worried as my knee was sore and tender. 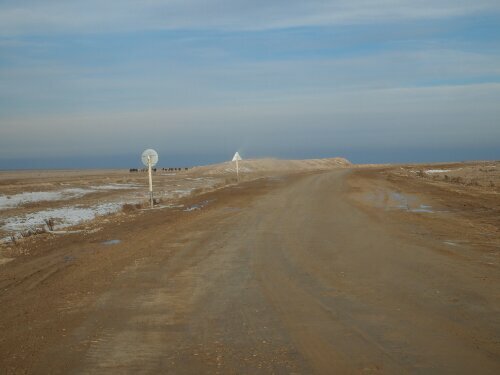 The hard riding into the wind and pushing on to reach Shetpe had aggravated the twist from Aktau. I felt I could still cycle, so I rubbed some Ibruprofen gel into it and hoped for the best: good roads and a tailwind. Sadly I only had both for about ten minutes that day, when the road jinked through some hills. The rest of time the road was either terrible or the winds relentless or both together. As I fought forward I could feel my knee getting more sore and by the afternoon it was hurting with pretty much every pedal stroke. I basically went for d) and kept riding hoping something would come to me before the top of the hill – I’m not sure what I was expecting! 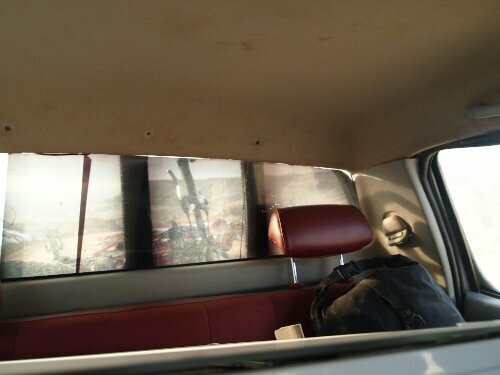 Something did come up though, next thing I know a Toyota pick up truck has pulled up beside me and a guy is asking me where I am going – I say Beyneu – which is the next major town. He looks at me incredulously and asks if I want to put my bike in the back. About fifty things flew through my mind. I had wanted to ride all the land sections on the trip and I felt like it would be giving up if I put my bike in the back. 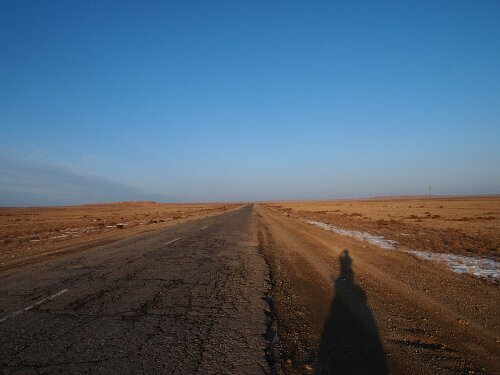 At the same time I could feel my knee was definitely not getting any better and I didn’t want to set up camp in the desert and wait for it to improve at the expense of days in Uzbekistan, apart from the fact I was pretty much in the middle of nowhere with water for a maximum of two days. 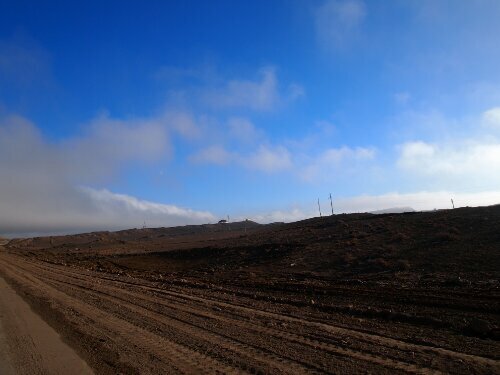 Also it was pretty boring out here and I knew the road was going to get worse…much worse. In fact I was coming up on a stretch that one cyclist had described as the worst road in the world. So with all that flying through my mind I decided this trip wasn’t about cycling every inch at the expense of enjoying myself and I also felt there was a very real risk of my knee getting worse and being put out of action properly. With that in mind I looked from the man to the bed of his truck and figured we’d get the bike in there. Next thing it’s strapped down (it would have to be restrapped down about five times as the road got so bumpy it kept coming loose) and we were off. It felt very weird being in a vehicle and initially driving along at speeds that would see us do in an hour what would take me a day to cycle. 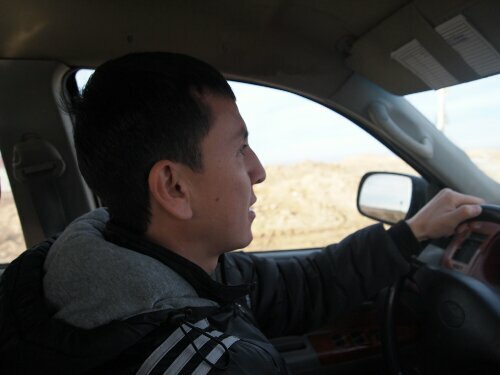 Yerlan, the guy who’d picked me up was of course very nice and appeared to be a good driver. He had to be. As the rumours were true and the road was absolutely crazy, calling it a road at some points was perhaps overly generous. It became a series of barely defined mud tracks winding across the desert together as cars had deviated from the original track trying to find one that was less of a mire. Yerlan kept looking for a better track, personally I thought he should just give up and take the main one as all of them were pretty awful. At one point we ended up totally off road and went through a small ditch, the jolt almost put me through the windshield and my head was spinning from the impact for the next kilometre. It was a sharp lesson in why seat belts are important! The ride from where Yerlan picked me up from to the next major town was 270km and it took us about 5 hours in the car…which was pretty quick given the road! As I arrived it felt strange I was used to slowly rolling into a town trying to figure out where I’d be able to stay. Instead we drove up to the first hotel we saw and unloaded my bike and gear – I felt like a fake! I tried not to let it get me down and bought Yerlan dinner as thanks and then bid him goodbye as he sped off for his destination further up the road. I was now in Beyneu…about five days early! 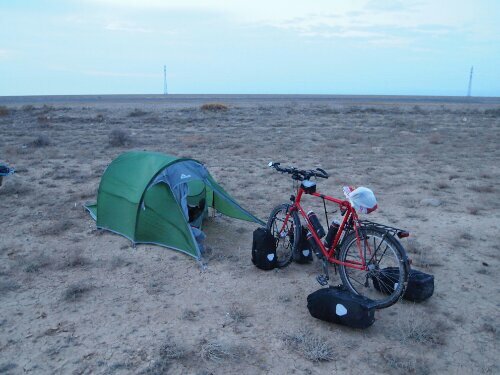 December 9, 2013 in Countries, Cycle touring, Kazakhstan.